All the fuss around Valentine’s Day saddens me. And I hasten to clarify, it is not the holiday itself or being single on V-Day that upsets me. I seriously couldn’t care less about it. But I feel really sad that so many single people feel lonely on Valentine’s Day—or feel bad about themselves because they aren’t coupled up. I used to feel that way. And I’m not sure when I moved past that, but in more recent years, I’ve been pleasantly surprised to notice that the whole hoopla of flowers, cards, and chocolates that explodes around us has no effect on me whatsoever. Let me tell you, it’s great to be immune to the subtle shaming of our societal conditioning that we should be in a romantic relationship. But that’s not to say we can’t celebrate Valentine’s Day, whether we’re single or coupled up. These days, if I remember on the day that it is the “Feast Day of Love,” I do celebrate. Because love is for all of us, and the greatest love of all is the love we have for ourselves. So, this Valentine’s Day, I suggest you do unto yourself what you would have a lover do unto you. If you were in a relationship, how would you want to mark Valentine’s Day? With a lovely candlelit meal? Then do that for yourself, or with other single friends. If the idea of hitting a restaurant filled with lovey-dovey couples is all too much for you, then do it at home. And order in, instead of cooking. With flowers or chocolates? Of course you can buy your own, but do so in a ceremonial way. Consciously acknowledge that you’re doing this as a gesture of love and appreciation for yourself (as opposed to numbing yourself from feelings of loneliness, which is an entirely different experience). And remind yourself of this as you arrange the flowers and enjoy the chocolate. With a weekend getaway? Treat yourself to a day trip or weekend away. Go it alone, and you never know what future love you might bump into. Or invite a friend to join you, and focus on connecting with each other and having a really good laugh. Remember, though, that we don’t have to mark the day through treats. We can also do it by celebrating our feelings—even if they are uncomfortable ones. If you’re feeling lonely in general, don’t try to suppress that. Sit with the feeling, and explore the thought patterns behind them—the judgments and the expectations. Allow tears to come. They are a purging of our emotions. When we feel things fully, our bodies can release them. Hence, the sometimes surprising experience of feeling better after having had a good cry. And once you let those out those feelings of being deprived because of the romantic relationship you don’t have, then consider making a list of all the other loving relationships you do have. Spend some time soaking in appreciation for the good people already in your life. Most of all, remind yourself that you are okay, exactly as you are. Single may not be our preferred state, but it’s not a death sentence. And don’t be fooled by all the exchanges of flowers and chocolates going on around you—a lot of that is nothing more than conditioned expressions of what society expects from people in relationships. Love yourself—today and everyday—as best you can, and hold out for a loving partner who will truly love you back. Remember, true love isn’t marked through flowers on Valentine’s Day. It is marked by the little things, day in and day out. Because here is the other thing about Valentine’s Day that saddens me: it is a salve to ease the pain of a less-than-fulfilling relationship. A sticky plaster to try and hide festering wounds that aren’t being properly tended to. 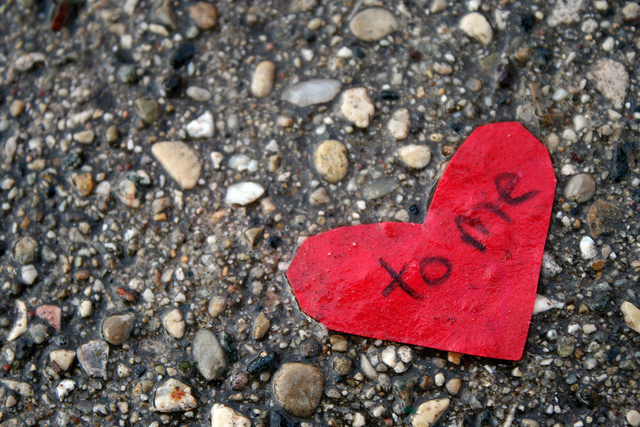 In truth, singletons aren’t the only ones to potentially feel lonely on Valentine’s Day. But at least we are a few steps ahead of those for whom the holiday is surfacing the knowledge that the relationship they’re in isn’t right for them. Knowing we need to have difficult and honest conversations and hurt another in order to be true to ourselves….that’s a hard place to be on Valentine’s Day. And even worse is to find ourselves accepting the flowers and chocolates as a consolation prize for a poor quality relationship that we don’t yet feel ready or able to leave, for whatever reason. Being single on Valentine’s Day doesn’t have to be something to dread. We are in a great place to celebrate our own selves and turn the holiday into something we can enjoy on our own. And I think we should embrace that. Wishing you a self-blessed holiday. This Valentine’s Day, Love like a Buddhist. Hilda Carroll is a certified meditation teacher who is passionate about making the benefits of the practice accessible to all. With that in mind, she has created a 28 day beginer’s ecourse which is specifically designed for busy people with not much spare time. An eternal student, Hilda is currently focussing on interior design from the perspective of creating sacred spaces. If you want to turn your home into an everyday sanctuary, why not join her free 30 day decluttering challenge.